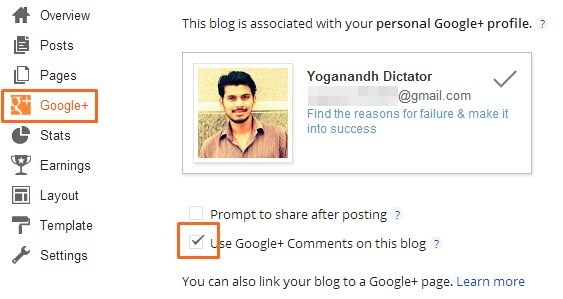 Blogger is updating all it's tools, in it timeline, Blogger recently improved Blogger template HTML Editor , now it has introduced "Comment Using Google+" which is similar to "Comment using <OpenID>"
Users can now comment using his/her G+ id, if user does not have G+ id, they will be prompted to create Google+ id. For developers/blogger upgrading to Google Plus Comment box, Current comments or previous comments, that was commented using blogger profile will remain same. But comments posted using 3rd party widgets such as Disqus will disappear. You might end up in trouble if you are using Custom Templates such as mine. To activate "Comment using Google+" in Custom Templates, you have to REPLACE your current comment box code with Google+ Comment box. Plz backup your template incase if anything goes wrong. Save and you are ready to use Comment using Google Plus in your custom template, however there is no guarantee, that this might work until you figure out correct position to replace code. See demo of Comment box implemented in this blog.